As climate alarmists struggle to understand the 'travesty' of no global warming since 1998, a new warmist paper claims it has the answer: a sharp rise in China's coal use has spewed sulfur emissions into the atmosphere to cool the planet. One glaring problem with this theory is that figure 1 of the paper shows that there has been no change - zero - in the effect of sulfur emissions on global temperature since 1998. 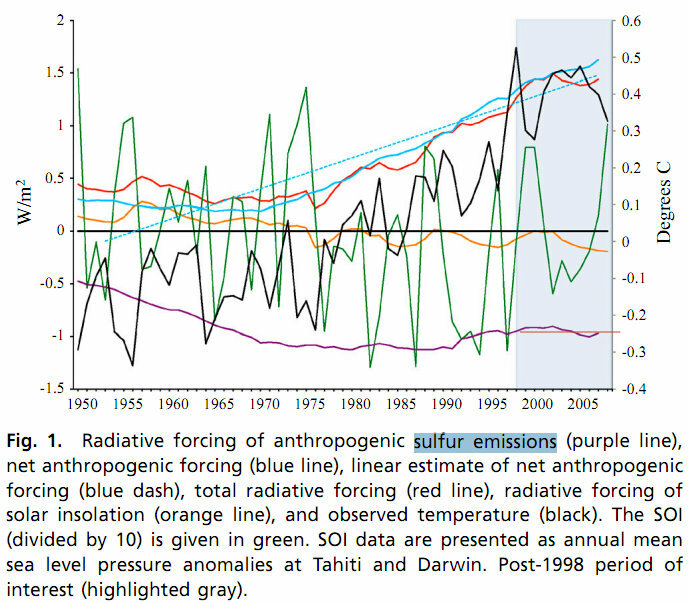 The supposed effect of sulfur emissions (purple line) on anthropogenic forcing (man-made influence on global temperature) shows no change in effect on global temperature since 1998. The post 1998 period is highlighted in gray and effect on global temperature shown on right vertical axis. 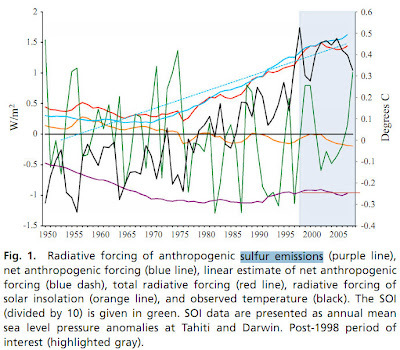 Thin red horizontal line added from 1998 onward to show zero change in effect of sulfur emissions on global temperature since 1998. This news item today from the BBC refers to the same study, and notes it was inspired by a skeptic telling the author of the paper he heard on Fox News that the world has not warmed since 1998. The lull in global warming from 1998 to 2008 was mainly caused by a sharp rise in China's coal use, a study suggests. The absence of a temperature rise over that decade is often used by "climate sceptics" as grounds for denying the existence of man-made global warming. But the new study, in Proceedings of the National Academy of Sciences, concludes that smog from the extra coal acted to mask greenhouse warming. China's coal use doubled 2002-2007, according to US government figures. The researchers conclude that declining solar activity over the period and an overall change from El Nino to La Nina conditions in the Pacific Ocean also contributed to the temperature plateau. Lead researcher Robert Kaufmann from Boston University, whose research interests span climate change and world oil markets, said the study was inspired by "sceptical" questioning. "Two years ago, I gave a talk to a general audience in New Jersey about climate change," he told BBC News. "And an older gentleman asked me 'why should I believe in this climate change - I was watching Fox News and they said the Earth's temperature hasn't changed in 10 years and has actually gone down'. "At that stage I wasn't paying much attention to climate change - I'd returned to working on oil markets - so I went back and checked the data and found that was just about right." Mainstream climate scientists have traditionally answered the "no warming since 1998" claim in two ways. One is by pointing out that 1998 saw the strongest El Nino conditions on record, which transfer heat from the oceans to the atmosphere, warming the planet. So while you may not see a temperature rise if you start the series in 1998, you do see one if you begin with 1997 or 1999. The second answer is to point out that temperatures will naturally vary from year to year, and to point to the consistent upward trend seen when long-term average temperatures are used rather than annual figures. But the new study, which uses statistical models that are very different from the models traditionally used to simulate the Earth's climate, offers an alternative way of explaining the apparent halt. According to figures from the US Energy Information Administration (EIA), the rate at which coal use was increasing around the world showed a sharp acceleration around 2003, with China in the vanguard. China's consumption had doubled over two decades from 1980. But from 2002, it doubled again in the five years to 2007. As the latest report from the Intergovernmental Panel on Climate Change (IPCC) emerged in 2007, it was not able to include this data. Piers Forster from the UK's Leeds University, who led the IPCC chapter analysing factors affecting global temperatures, said the new study was "interesting and worthwhile". "The masking of CO2-induced global warming by short term sulphur emissions is well known - it's believed that the flattening off of global mean temperatures in the 1950s was due to European and US coal burning, and just such a mechanism could be operating today from Chinese coal," he told BBC News. "Other natural fluctuations in the Sun's output, volcanoes and water vapour have also been proposed for causing the non-warming 'noughties', and may have contributed to a degree. "It needs to be emphasised that any masking is short-lived, and the increased CO2 from the same coal will remain in the atmosphere for many decades and dominate the long-term warming over the next decades." Since the end of the study period, in 2007, China's coal consumption has risen again by about 30%. The European and US coal boom after World War 2 caused such an environmental impact in terms of urban smog and acid rain that many governments introduced legislation curtailing the output of aerosols. As the air cleared, global temperatures began to rise again; and Professor Kaufmann believes the same thing is likely to happen now, as China and other developing countries get to grips with their burgeoning environmental issues. The last two years' data suggest temperatures are once more beginning to rise; but how fast this happens depends on a number of factors. One is how quickly the rapidly industrialising countries mandate the fitting of equipment that removes sulphate particles. Another is solar activity. Recently, it showed signs of picking up as the Sun enters a new cycle of activity, although recent research raises the possibility of a new lull. Other research groups, meanwhile, have produced evidence showing that natural cycles of ocean temperature, such as the Atlantic Multidecadal Oscillation, may restrain temperatures for another decade or so. Uncertainties over aspects of the Earth's immensely complex climate system, such as melting ice and the behaviour of clouds, could also skew the overall picture. But Robert Kaufmann is in no doubt that temperatures will pick up if greenhouse gas emissions continue to rise. "People can choose not to believe in [man-made] climate change - but the correct term here is 'belief' - believing is an act of faith, whereas science is a testing of hypotheses and seeing whether they hold up against real world data. That's not what ol' "Crazy" Joe Romm at ThinkProgress says about this topic, though. He says the "deniers" just don't understand.